Scelsi's Preludi form a kind of musical diary, an aural commonplace book … ideas as they occurred to the composer, worries, delights, experiments, work-notes and the like. Since we're not even sure that the corpus as so far published represents the intended entirety of this work by Scelsi, it's tempting to doubt the pieces' musical integrity as well. Are they to be treated as fragments? To what are they preludes? How fully did the composer intend them to be explored, exposed and explained? Scelsi was notoriously evasive in helping other music-lovers understand his work. 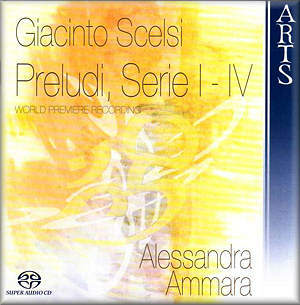 These Preludi were composed throughout Scelsi's life. His tendency to obscure biographical details makes them difficult to date more precisely than towards the early-middle of his career. His is a strange mixture between obscuring the autobiographical and at the same time basing much of his output on themes, ideas and events that clearly grew out of his own life. This CD, though is not a curiosity; it is full of beautiful, penetrating and demanding music. And will be enjoyed by the open-minded. Most of the Preludi are understated and gentle. Highly focused and concentrated. Rarely does the composer ask of the piano anything of which it is not immediately capable. They make their impact by being contained - reticent, almost. Alessandra Ammara has consistently captured their withdrawn quality. Like a classic pianist exploring Beethoven or Schubert, Ammara at once conceals yet at the same time emphasises what the instrument can do. This is how Scelsi intended the pieces to sound. As a result this is a recital of great pianistic confidence as well as aesthetic appeal. In the widest musicological terms, Scelsi's contribution to the evolution of twentieth century music was largely transparent until twenty or so years ago. Given some very particular techniques such as his interest in single-pitched composition, it's safe to say that Scelsi is still poorly understood. His presence on the mid-twentieth century European musical scene is clearly reflected in his absorption with micro-tones, advanced time signatures and serial technique. Where these fit into an oeuvre that focuses on pianism has also to be considered if we are to evaluate Scelsi's work in ways that have only recently begun. And at the forefront of contributions to that evaluation are such performers as Ammara; it is as though the instrument is an extension of her curiosity and persuasion - without a hint of rhetoric. So, aside from the technical challenges and musical variety of the four dozen or so short movements - none is longer than six minutes; most last just one minute or so - on this recording, such larger interpretative questions are uppermost in the performer's mind. They have been answered very well. That's to our benefit: there is no other recording in the catalogue. The highly accomplished Alessandra Ammara explains in the accompanying notes that what struck her most in reference to such musicological concerns as those is the way in which Scelsi apparently distilled quite extensive ranges of emotion and mood. He miraculously captured, particularly, dreamlike and magical experiences in this music. Clearly an understanding of this and the exact nature of the Preludi is a prerequisite to a persuasive performance. Add to this insight a refusal to treat the music as impressionistic. Then her playing emerges as having firmly come to grips with what otherwise might have seemed disparate and arbitrary. And that's why Ammara's approach works so well here. Her style is concise and incisive without being at all fractured. She's allowed cross referencing - of clusters and changes in tempi, for example - further to reinforce the 'meaning' of the music. If there is a skeletal quality to the Preludi, if their aphoristic qualities are more the result of gauntness than spurious eclecticism, then the task of the interpreter is to make the skeleton stand for something, to support advanced or unique musical ideas. Above all, to play the Preludi as music, not technical exercises. This is precisely what Ammara does. Her playing is situated in a vision only possible because of a good grasp of the overall architecture in Scelsi's mind that led to the production of such an otherwise apparently heterogeneous collection of pieces. Much is made in the CD packaging and booklet of the fact that this is an audiophile recording. Indeed, it is fine-sounding in every way. There is a warmth and presence from first note to last which nevertheless neither cloys nor swamps. The dignity and almost 'take-it-or-leave-it' spirit of Scelsi's tempi, textures and melodic invention are never compromised. A great testament to a composer who deserves to be better appreciated. This will help.